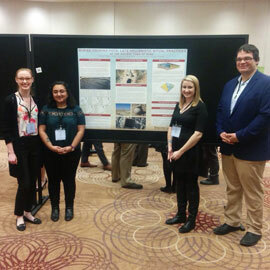 Wilfrid Laurier University Archaeology and Heritage Studies students had the unique opportunity to present their research findings from an archaeological dig at the Town of Nebo, Jordan at the Archaeological Institute of America (AIA) conference in Toronto in early January. Fourth-year student Lauren Mason led the project and worked closely with Archaeology and Heritage Studies Assistant Professor Debra Foran to prepare a poster of the team’s research – a discovery of over 43 fully intact pots from the Hellenistic period (1st century AD). The team was made up of fellow fourth-year undergraduate students Ashley Paling, Grant Ginson and Laila Hack. “To have our research seen by other scholars makes you feel validated as a researcher yourself, like you’re part of this academic community,” said Ginson, who led the 3D modeling component of the poster project. Laurier’s Archaeology and Heritage Studies program requires all students to participate in a field school component either in Ontario, at Fort Erie or in Midland, or overseas, in Greece or in Jordan. The team originally travelled to Jordan in 2014 with Foran and a group of 28 archaeology students. At that time, they uncovered nearly 20 fully intact pots that were found upright and filled in with dirt. A miqveh – a Jewish ritual bath – was also found close by, leading the group to believe the pots were buried for some kind of religious ceremony. The team returned in 2016 as supervisors to continue their research and collect more data on the artifacts. The team received a grant from the Student Horizon Fund, which helped them present their research findings and attend the entire conference. The student researchers plan to visit Jordan again over the summer. Eventually, they plan to publish their work after determining more about the context of the artifacts. Read more on the Town of Nebo Project blog.